Spending twenty days in the Antarctic and South Georgia Island, I am happy to say that the entire experience was beyond our expectations. Hapag Lloyd is genious at marrying bold expedition cruising with a top rate hotel experience. Their ships have the highest ice class hull rating available, knowledgeable bridge officers who are experts in these regions, and a first class hotel staff. Hapag Lloyd’s commitment to the polar regions is such that there will be three out of five of their ships in the region at any one time. Our captain was adept at making changes as needed, and ventured far into the ice fields. In my cabin, I could hear the ice scraping against the hull as the ship navigated it’s way into the Weddel sea (famous for its ice, which Earnest Shackleton got stuck). As our landing site was not accessible, the captain sent out an exploration party to find a suitable ice flow, for us to visit via the zodiacs. Once there we were greeted with champagne in flute glasses with a proper bar set up! Later in the cruise, we had a cocktail party where if harvested from the Berg was chipped away for cocktails. This was the very last cruise of the Hanseatic in the Antarctic, so I will not go into details of the ship. The good news for anyone planning a trip, ie, you my dear readers, is that the new bilingual expedition ship, the Inspiration, being built specifically for Polar cruising will be coming online in October 2019. This leaves a gap, with no expedition sailings for a year. This is an unfortunate but unavoidable problem, as the Hanseatic is leased, and the owner is recalling the ship this fall. We had 160 passengers on our sailing, with ample time ashore. The system of our landings was well organized. Boots and parkas were fitted on a sea day. There are two proper boot rooms (one for odd cabins the other for even) where we would store our boots and life preservers in cubbies marked for our cabin after each outing. There were several boot washers so never a wait. I can’t imagine having to store boots in my cabin, as some other lines require. Or having to rent them! The crew found landing areas that did not require us to step in deep water, as I have sometimes read. The waterproof, insulated boots were perfect. The dining room staff learned our preferences right away. The menu never repeated in twenty days. Plenty of variety offered at our six course dinners. Breakfast featured the cold items on a buffet, a dozen types of bread, juices, champagne, fruit, meats and fish, yogurts, cereal. The hot menu went from all the egg dishes to lamb chops, eggs Benedict, waffles, and many other items. Lunch was in two venues, with heat lamps on the outside aft deck, allowing al fresco dining in cold weather. Also, hot boullion every day at 11, afternoon tea (sometimes special items like a waffle buffet), before dinner bites in the observation lounge as well as late night snacks were offered. Service and programming was upbeat and enthusiastic and site specific,The staff was always available to offer a blanket, a drink, tea, an item from the buffet, and so on, Around the pool as soon as the weather got hot, there was ice tea. When it was cold, there was a hot tea (from an extensive menu). When we arrived in Rio, it was the local cocktail. In fact they had a special dance troupe onboard for our last night. At South Georgia Island, there were rum shots offered at Sir Earnest’s grave as well as a theme night dinner. Tea was brought ashore along with mulled cider and cookies as well. There was a Pool party with a Danish theme on a sail away from Antartica. A Baviarian themed lunch, a king crab theme lunch, etc. we had caviar and vodka shots one night at dinner. Our Ice flow champagne party, and more. We had an open bridge most of the time, unless there was a red sign in the door. Very interesting. I could check what the seas were forecasted at or sea how they were plotting routes through weather systems, we were even offered a tour of the engine room, which was very extensive and very interesting, One afternoon we had a science fair with microscopes and our experts to see things in a new way. Everyday had science lectures with our team of experts. These were also on tv and could be viewed in or cabin. A surprise offerince were the three to four exercise classes lasting thirty minutes which I loved, We even did cardio outside in Antartica in our parkas. 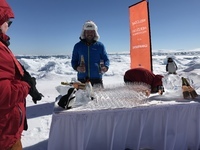 Champagne party on ice flow on the Wendell Sea. Spending twenty days in the Antarctic and South Georgia Island, I am happy to say that the entire experience was beyond our expectations. 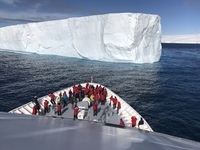 Hapag Lloyd is genious at marrying bold expedition cruising with a top rate hotel experience. Their ships have the highest ice class hull rating available, knowledgeable bridge officers who are experts in these regions, and a first class hotel staff. Hapag Lloyd’s commitment to the polar regions is such that there will be three out of five of their ships in the region at any one time. Our captain was adept at making changes as needed, and ventured far into the ice fields. In my cabin, I could hear the ice scraping against the hull as the ship navigated it’s way into the Weddel sea (famous for its ice, which Earnest Shackleton got stuck). As our landing site was not accessible, the captain sent out an exploration party to find a suitable ice flow, for us to visit via the zodiacs. Once there we were greeted with champagne in flute glasses with a proper bar set up! Later in the cruise, we had a cocktail party where if harvested from the Berg was chipped away for cocktails. This was the very last cruise of the Hanseatic in the Antarctic, so I will not go into details of the ship. The good news for anyone planning a trip, ie, you my dear readers, is that the new bilingual expedition ship, the Inspiration, being built specifically for Polar cruising will be coming online in October 2019. This leaves a gap, with no expedition sailings for a year. This is an unfortunate but unavoidable problem, as the Hanseatic is leased, and the owner is recalling the ship this fall. We had 160 passengers on our sailing, with ample time ashore. The system of our landings was well organized. Boots and parkas were fitted on a sea day. There are two proper boot rooms (one for odd cabins the other for even) where we would store our boots and life preservers in cubbies marked for our cabin after each outing. There were several boot washers so never a wait. I can’t imagine having to store boots in my cabin, as some other lines require. Or having to rent them! The crew found landing areas that did not require us to step in deep water, as I have sometimes read. The waterproof, insulated boots were perfect. The dining room staff learned our preferences right away. The menu never repeated in twenty days. Plenty of variety offered at our six course dinners. Breakfast featured the cold items on a buffet, a dozen types of bread, juices, champagne, fruit, meats and fish, yogurts, cereal. The hot menu went from all the egg dishes to lamb chops, eggs Benedict, waffles, and many other items. Lunch was in two venues, with heat lamps on the outside aft deck, allowing al fresco dining in cold weather. Also, hot boullion every day at 11, afternoon tea (sometimes special items like a waffle buffet), before dinner bites in the observation lounge as well as late night snacks were offered. Service and programming was upbeat and enthusiastic and site specific,The staff was always available to offer a blanket, a drink, tea, an item from the buffet, and so on, Around the pool as soon as the weather got hot, there was ice tea. When it was cold, there was a hot tea (from an extensive menu). When we arrived in Rio, it was the local cocktail. In fact they had a special dance troupe onboard for our last night. At South Georgia Island, there were rum shots offered at Sir Earnest’s grave as well as a theme night dinner. 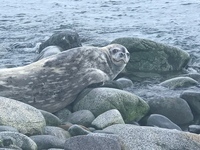 Tea was brought ashore along with mulled cider and cookies as well. There was a Pool party with a Danish theme on a sail away from Antartica. A Baviarian themed lunch, a king crab theme lunch, etc. we had caviar and vodka shots one night at dinner. Our Ice flow champagne party, and more. One afternoon we had a science fair with microscopes and our experts to see things in a new way. Everyday had science lectures with our team of experts. These were also on tv and could be viewed in or cabin. A surprise offerince were the three to four exercise classes lasting thirty minutes which I loved, We even did cardio outside in Antartica in our parkas. It was big with lots of storage. I loved the low deck for its proximity to the side gates used for our zodiac trips.